Today I am here with Daniel Beleza, it is a huge pleasure for me to have him because I have been following his career for a long time. 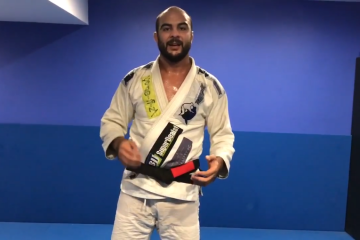 He made the adult division Black Belt Worlds Finals in 2001 when I started Jiu Jitsu as a white belt and he made it in 2015 when I won the double gold as a black belt. That means he has been competing at the highest levels if bjj since I started! Its amazing guys, huge respect for him. He is also the oldest guy to ever make it to the finals of the worlds, when he got second place in 2015 in the adult division he was 39! Today he is going to share with us one of his best techniques that actually works really well against my game so let’s see how he does it below and then I will break it down. It is a loop choke from the double unders. Guys so this position works really well on me because he pretends that he is going to give me the over under position and then he sets up the loop choke. It is a trap and he is very good at this position, his timing is amazing. The loop choke is a very powerful choke and not many people are going to see this coming from the double unders position. People get very focused on passing and they forget about the submission. I think this is a really good move for you guys! Try this position out and see how it works for you, Daniel has done this many times in the black belt competition. Also if you have not already download my FREE E-Book guys! 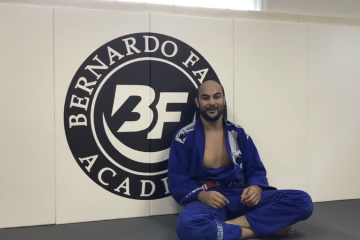 I say this every time because I really think it will help your bjj! Also guys Daniel has a DVD set out with a lot of his best techniques, you can click on it below and get it if you like! Daniel is one of the best!